In the distance, they begin to hear the quiet roar of his Tahoe rolling over the gravel. Within moments they can feel the pound of his leather boots walking up the steps to our house. The creak of the front door is quickly followed by the crackling of Velcro as he takes off his belt and it lands on the table with a thump. These are the sounds that tell my children that their daddy is finally home; these are the sounds of relief. My husband became a law enforcement officer before our children were born. 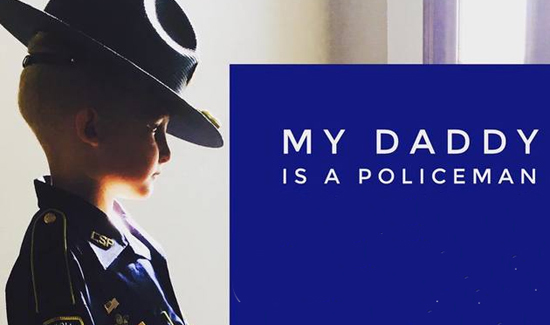 As our children grew, they learned that their daddy took an oath to protect and serve the citizens of our great state. Their daddy is not only their protector, but everyone else’s too. Loving a parent who wears blue is both a blessing and a curse. These children learn crucial life lessons at a young and tender age. The pride they have in their parent exudes with every breath they take, however hidden behind their strong face is a prayerful heart that their mom or dad returns to them after every shift. SERVICE TO OTHERS. Law Enforcement Officer (LEO) children watch with wide eyes as their father suits up before his shift, shining his buttons and boots, to go out and make the world a safer place. They see his desire to protect not only their little lives, but also the lives of everyone. They learn the importance of serving others, especially in troubled times. They learn to love their community and learn selflessness. They also learn about courage; courage to be a defender and a peacekeeper for the masses.